We live in a society where people increasingly find themselves with jobs and hobbies that have them sitting down. If you are at school, you are very likely sitting at a desk or computer. Should you have a job in an office, it is the same situation. Since you are here at CheatCC, one of your major hobbies probably involves playing console, handheld, or computer games while, you guessed it, sitting. The solution, for some, are standing desks or VR games that require you to actually stand up while doing these actions. But even that can get tiring after a while. Enter the Wurf Board! It’s designed to make standing activities easier. When you are standing for long periods of time, you can exhaust or hurt yourself without even realizing it. Locking your knees up while standing is one issue, since people who stand at attention like that could cause tension and even fainting, since the blood pools in your legs. The Wurf Board is designed to prevent things like that from happening. Once you place it under your feet, it helps make you more comfortable and encourages you to keep moving, so you don’t feel like you are endlessly standing forever or feel tempted to stand at attention, possibly hurting yourself. Here’s how it works. First, you get a Wurf Board that accommodates your needs and space. The Santa Cruz line runs from 28.3” x 14.2”, which can support a 200lb person, to 32.9” x 17.7”, which can handle a 300lb person. 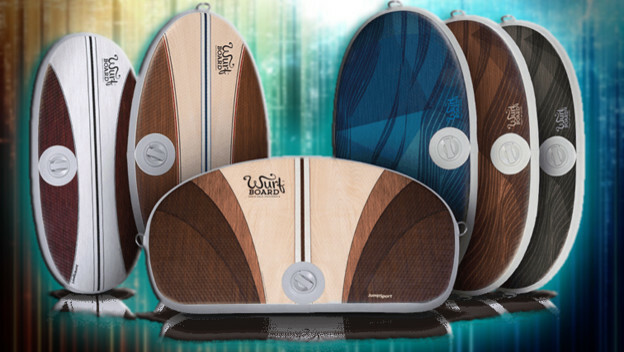 There is also the Maui, a medium-sized Wurf Board that is 30.6” x 16.6” and supports 350lb. Each one is about 2lbs and can easily be moved, in case you decide to alternate between standing and sitting. Once it is in place, you stand on the air-spring surface. Installed! The Wurf Board encourages you to move, but in a way where you never really have to worry about actually falling or being uncomfortable. It is designed to constantly grip any surface it is placed on, be it a hard, solid floor or carpeting. You adjust the air-spring surface, to make it as soft and bouncy or firm and stable as you want. You also can use the 2” high curved edges to massage your feet while you stand, so you aren’t putting undue pressure on parts of your body. And, even though this is an inflatable item, you can wear all sorts of shoes while using it. Though, with the massaging elements, I would almost recommend going barefoot or only wearing socks. 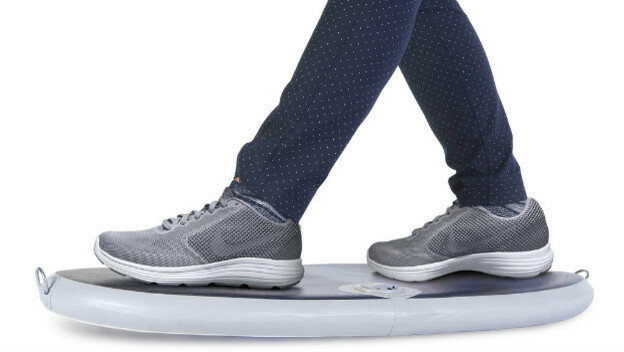 Since you’re constantly making these micromovements while standing on it, actions you may not even be aware of, you’re keeping yourself slightly active, releasing tension, and taking advantage of the cushioning properties of the Wurf Board. The more I look at it, the more I see a Wurf Board being a practical game room fixture. If you have a VR headset of some sort, of course you could use one. After all, these require standing motions. You may need to move about, and being upright makes it easier to deal with the various cords. Having a Wurf Board underfoot could allow you to be more comfortable while gaming and enjoy longer sessions. But even if you’re setting down, it could be handy. After all, you’ll be playing games after a long day at work or school, and this is an ergonomic device that is designed to massage your feet when pressure is applied to it. A Wurf Board could be a way for you to be more comfortable and pursue a healthier way to work or game without too much extra effort. After all, standing is the new sitting. It can help you stay in shape, improve your posture, and be a little more fit than the alternative. But, standing could get tiresome. Investing $199 on the smallest Santa Cruz Wurf Board, $269 on the largest Santa Cruz, or $299 on a Maui could provide a perfect complement to this healthier lifestyle. You may even find yourself using it while sitting too, what with the comfort and support it provides!